Two years ago, Benny Gordon came to Jennerstown Speedway surrounded by question marks. He had yet to win for East Coast Motorsports, and the pressure was mounting. Two years later, the pressure has eased and those questions have been answered—and them some. On Saturday night, Gordon took the lead away from away from Johnny Rumley with 31 laps remaining in the Naturally Fresh 250 presented by Hooters Air and held off Gary St. Amant to win for the second time this season. "I really wasn’t sure what was going on with the car," said Gordon, who picked up $500 via the Greased Lightning "Blast the Pack" Award after leading a race-high 79 laps. "Joel Kauffman radioed in that he thought my right-rear wheel was loose. Come to find out, all lug nuts were loose. We caught a caution just in time to stay on the lead lap." But Gordon still had a long way to go to get back to the front with just 75 laps remaining. Gordon restarted ninth after the green waved again and began to work his way towards the front, passing D.J. Kennington for fourth on Lap 178, Gary St. Amant for third on Lap 193 and Mardy Lindley for second on Lap 202. But, with 40 laps remaining, Gordon was 1.1 seconds behind race-leader Johnny Rumley, driver of the No. 8 Lucas Oil Chevy. A late-race spin by Mardy Lindley allowed Gordon to close the gap. On the ensuing restart, Rumley’s car developed a skip in the engine, enabling Gordon to sweep past Rumley with ease on Lap 219. "I really would have liked to race Johnny [Rumley] for the win," said Gordon. "Win or run second, it really would have been fun to get to race with him." "My career has really changed in the last three years," said Gordon, who has won nine times since taking over the reigns of the No. 66 Predator Performance Ford last season. "It all started [at Jennerstown] when we won a Championship race here. Ever since then, my career has taken off. It’s been because of a lot of hard work by this team, who work on this car relentlessly." It appeared Gordon was going to have to do a lot of hard work to win the Naturally Fresh 250. After passing Rumley, Gordon checked out on the field for a brief time, but the race’s final caution on Lap 237 brought St. Amant to the rear-deck lid of Gordon for a down-finger restart with eight laps remaining. St. Amant, enjoying his best run of the season, tried to pressure Gordon into a mistake, but the short-track veteran fell .397 seconds shy of his second career Pro Cup victory. 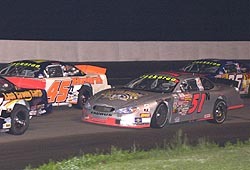 Gary St. Amant (#11) and Gordon (#66) were the two main players in the race at the end of the night. didn’t show up prepared to race, and we were lucky to get the finishes we did. We did our homework, and I thought we had a good car coming. But the way I look at it, we were first in class today." St. Amant second-place finish was his best of the season. D.J. Kennington also posted his best finish of the season by coming home third. Actually, Kennington’s finish was the best of his Pro Cup career. "The car was just good," said Kennington, driver of the No. 17 SM Freight Inc. Pontiac. "We really didn’t make a lot of changes to the car all day. We only took two tires on the pit stop and ran the whole race on the left-side tires. I thought we may have had a little bit for Gary [St. Amant], but I wasn’t going to force the issue. We were looking for our first podium finish, and we’ll take it." 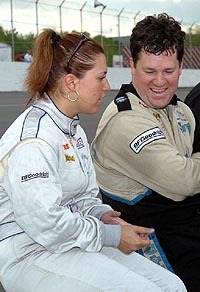 Michelle Theriault (left) started the race at Jennerstown, but Michael Ritch finished it for her. Michael Ritch, driver of the No. 86 Jackaroo Ford, followed Kennington closely under the checkered flag. Ritch, who took over for Michelle Theriault on Lap 66, climbed from the back to the pack to notch his best finish of the season. "Michelle was here to get points to get into the Championship Series, and I was here to get track time for the Championship Series, so it worked out for both of us," Ritch said of the driver swap on Lap 66. "For what we had to go through today, it was a great night of the Jackaroo-Nu-Go Ford." Danny Sammons also had to battle adversity to notch his first top-five finish of the season. Sammons, driver of the No. 97 Lost Creek Carts Ford, changed gears late in day, then had to overcome his team accidentally swapping the right-rear and right-front tires during a pit stop. "We actually had the wrong gear in practice, and we were about 60 points off," said Sammons. "The car was pretty good during the race. I decided to pit early for track position, and the crew wasn’t really ready for me to come in and they put the tires on wrong. We came back in, changed tires and got fifth. I just happy to get fifth after the night we had." Jeff Agnew, Tim Bainey Jr., Woody Howard, A.J. Frank and Mardy Lindley completed the top 10. Vince Fanello, driver of the No. 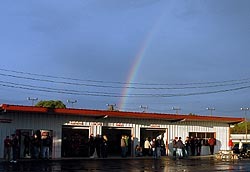 14 Elite Auto Collison Center Chevy, won the Mr. Gasket Hard Charger Award for advancing 13 positions to finish 12th. The first 68 laps of the Naturally Fresh 250 were run under the green and yellow flag until Jennerstown Speedway was dry enough to start green-flag racing. Once the green waved, the race was slowed nine times for 48 laps of caution. The Naturally Fresh 250 featured eight lead changes among seven drivers. With just five cars left to complete Advance Auto Parts qualifying, a rain shower washed away any chance of completing time trials. This meant the field was set by Northern Division points, leaving Southern Division drivers Mark McFarland, Toby Porter and Michael Ritch out of the field. It also meant that Gary St. Amant, who was on the provisional pole, wouldn’t pick up his first pole of the season. With race started by points, A.J. Frank, driver of the No. 45 American Ironhorse Ford, picked up $1,000 for being the Advance Auto Parts Pole Award winner. After a hot start to the season, Joel Kauffman has cooled off some—but only due to mechanical failures. 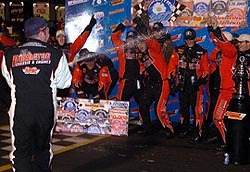 Kauffman, who led 17 laps of the Naturally Fresh 250, had a car good enough win at Jennerstown Speedway, but the oil-pump belt jumped off of the No. 44 RMI Pontiac and cooked the engine. Kauffman finished 29th. Tim Bainey Jr., driver of the No. 15 Greased Lightning Ford, showed why he calls Jennerstown Speedway home. Bainey led four laps of the Naturally Fresh 250 and finished seventh. "Man, the car was awesome," said Bainey. "We stayed out and decided to pit latter, because we didn’t think there would be 20 cars on the lead lap. We restarted 20th, but we were able to get back to seventh. I would have liked to get a top five, but that’s alright, this team is really starting to come together." Rain plagued the weekend and forced a lot of cars to miss the race. Joey Logano (#51) just made the show. When Logano Motorsports says it’s in the mail, it’s in the mail. Joey Logano was fourth fastest in Advance Auto Parts Qualifying, but rain negated his time. With only 34 drivers in attendance with points, the final two positions were determined by post-marked entry blanks. Logano’s entry was the first received and Randy Hawkins was second. Logano started 35th and Hawkins started 36th. tracks and new drivers each week. With five laps remaining in the Naturally Fresh 250 at Jennerstown Speedway, Howard and fellow Miller Lite Rookie of the Year contender A.J. Frank waged a ferocious battle for eighth place. In the end, Howard held off Frank and picked $1,000 for being the Miller Lite Rookie of the Race. But he didn’t know it until climbing from his car. "I thought that Tim Bainey [who finished seventh] was rookie," said Howard, who broke A.J. Frank’s three-race monopoly of being top rookie. "It’s great to win that award. Jim Dean [car owner] had to spend a lot of money after we wrecked the brand new car last race at IRP. We brought our old car tonight. It beat up, but it got the job done."